This Saturday, 18-Aug-2007, the Family History Library (FHL) in Salt Lake City, Utah will be closed until noon according to a FamilySearch spokesperson. At 6:30 AM that morning the Key Bank Tower, a block away from the library, will be exploded. Technically, explosions will be used to implode the building. 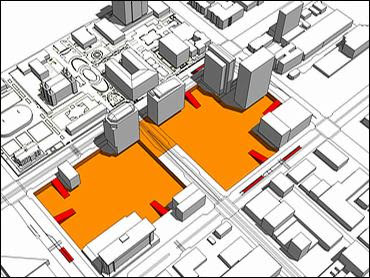 Because of the dust cloud that explodes from the imploding building, roads within the 9-block area shown below will be closed, including the road in front of the FHL. All buildings on the same block will be evacuated except the Marriott Motel. Presumably, most employees of FamilySearch will have front row seats, as they are officed in the Joseph Smith Memorial Building and the Church Office Building. However, those in buildings within the 9-block dust zone will be required to remain indoors for hours after the blast to allow for safety inspections and dust settlement. The public is asked to avoid coming to the site to witness the event. Local media will be covering the event live, starting at 6:15 AM. TV viewers will be able to watch the event from multiple cameras, all with better vantage than eyewitnesses, and will be able to watch the multiple replays before heading back to bed. 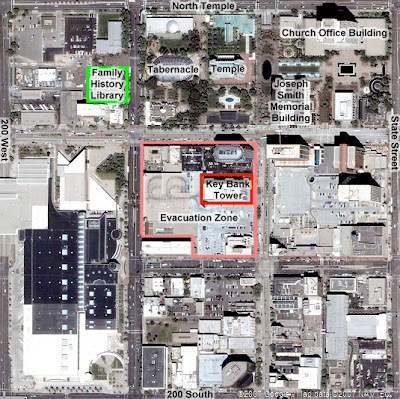 The building destruction is to make way for City Creek Center, an urban renewal project of the Church of Jesus Christ of Latter-day Saints which also owns the FHL. Part of the project is new underground parking. Having a common owner, can we hope that the FHL will give parking validations? You can hope, but the IRS makes mixing of for-profit and non-profit use of a common parking structure a problem. The church will end up paying the same parking rates for it's own use as it charges the for-profit users. Yes, the money goes out one pocket and back into another (less taxes) but it looks bad on the balance sheet. The best you may be able to hope for is lots of public parking.